Advanced Micro Devices Inc. on Thursday reported that its net income nearly doubled in the first quarter as the computer industry benefits from strong corporate demand. But the company is still without a permanent CEO after forcing out Dirk Meyer in a surprise move in January. AMD is the No. 2 maker of PC processors, with about 20 percent of the worldwide market. Its results help underscore a broader trend in technology spending: Companies' spending on PCs is perking up, and their interest in other kinds of computers - from tablets to mainframes - is also on the rise. While the company's results topped expectations, the reaction on Wall Street was subdued. AMD has for decades existed in the shadow of its larger rival Intel Corp. and is often squeezed on prices and has trouble finding new ways to expand the business. One potentially worrisome sign: AMD's prices for its processors, the "brains" of PCs, declined from last quarter, while Intel's prices increased. Intel reported its results earlier this week. And the prices for AMD's graphics chips, which are used for rendering video and other visually intense jobs that general purpose microprocessors aren't as good at, also fell. AMD stock declined on a tepid forecast that contrasted with a strong outlook offered by Intel. AMD shares fell 10 cents, or 1 percent, to $8.61 in extended trading following the release of the earnings report. AMD is banking on its graphics technology to help distinguish itself from Intel, and is just now starting to see results from its $5.6 billion acquisition of graphics chip maker ATI Technologies in 2006. AMD is now selling what it calls "accelerated processing units," or APUs, which are graphics and general purpose processors on the same chip. The products are at the center of AMD's strategy to promote its chips as more Internet- and high-definition-video friendly than Intel's, though the companies fight over how much graphics horsepower consumers actually need - and are willing to pay for. But the push has a downside. AMD's interim CEO, Thomas Seifert, said APU shipments in the first quarter "greatly exceeded" the company's expectations. But the chips were a key reason why AMD's prices fell. The first APUs AMD has been selling are smaller and less expensive than its regular microprocessors. That's because AMD is initially targeting "netbooks" and other smaller laptops with them. The company is now selling a more robust and expensive type of APU targeting higher-end laptops. 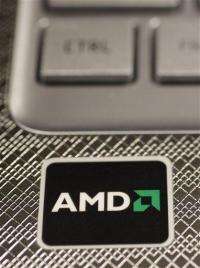 As a result, Seifert said AMD's gross profit margin is expected to rise in the current quarter. The figure was 43 percent of revenue in the first quarter, down from 45 percent in the fourth quarter. Seifert is temporarily filling the role vacated when Meyer was forced as CEO in January in a move that surprised many market watchers, since Meyer oversaw a turnaround in AMD's business and stock price during his 2 1/2-year tenure. The move was provoked by dissatisfaction on the board with the pace of AMD's turnaround and its lack of a presence in smartphones and tablets. The PC industry is changing. Although it's bigger than ever, with more than 1 million PCs being sold per day, the PC's dominance is being challenged by tablets and smartphones. Companies such as Intel and AMD are scrambling to position themselves to take advantage of demand for the new mobile devices. On a conference call with analysts, Seifert declined to give an estimate of when a new CEO would be hired. He said that "finding the right candidate is more important than hitting a specific time window." AMD said after the market closed Thursday that its net income was $510 million, or 68 cents per share, versus $257 million, or 35 cents per share, a year ago. Excluding items, mostly a $492 million non-cash gain for AMD's investment in its GlobalFoundries chip-factory spinoff, AMD would have earned 8 cents per share. That was 2 cents per share ahead of the average estimate of analysts polled by FactSet. Revenue rose 2 percent to $1.61 billion, which was slightly ahead of expectations. The company, based in Sunnyvale, forecast that its revenue will be "flat to slightly down" in 2011's second quarter from the first quarter. Analysts were generally expecting a slight decline, to $1.58 billion, according to the average estimate. I usually buy AMD because I want to keep them around. It prevents Intel from going into dirty business like they did in the 90's when everything PC was Intel, and everything other than the gimped "consumer" products were really expensive. I honestly don't know if I'm getting a better deal, but even if I'm not, the 10% difference really doesn't matter all that much. You could call it sour grapes, but at the end of the day it would only take me 2 minutes longer to run the simulation. I agree and I only buy amd whenever I can. I don't like the idea of intel monopolizing the chip business. And I like amd because it does not gouge its customers like apple does. The amd prices are decent and for all practical purposes I don't see any difference between my work pc with intel and my home pc's with amd. Considering how much CEO's get paid, maybe not having one is the key to doubling a company's profits. I only buy AMD products. AMD may be a slight industry lagger, but if some of us didn't support the competition Intel would not feel the pressure to lead and we would likely all be running 486 machines. I see my purchasing of only AMD products as sort of like pushing improvements from behind. I haven't had a single problem with the AMD chips I've bought over the past 6 years. It feels nice to look inside my PC and know I'm supporting market competition.